Hillside landscapes are one of the largest challenges a property owner can face. Some people would think that a hilly yard would be too difficult to landscape. But do not be afraid to try new ideas and have fun while creating your own design. Hillside landscaping is the most challenging of all residential design problems. Whether it is a natural undisturbed slope or one composed of cut-and-fill, there are five essentials that every homeowner should be aware of. Not all designers will be skilled in this special situation, so you must know your options before decisions are made that can not only be extraordinarily expensive to implement, they can have far reaching impact on the stability of your entire homesite. More hillside homes have been lost to wildfires than those on level ground. This is because fire moves on land like water – only in reverse. When vegetation down slope from the home begins to burn, rising heat causes the house to catch fire prematurely. Therefore what you do to the slope down hill from your house or your neighbor’s may dictate whether it survives a fire. 1. Preserve the view while solving problems. The reason people buy hillside homes is for the view, which may be panoramic or quite narrow. The home’s value is based on this, so all landscaping must be subordinate to the view. Before you begin any project that may impact this part of the site, define your view corridor, which is how you see the view from the interior rooms of the house. Also be aware of your neighbor’s view because what you do can compromise it now or in the future. Lawn aerators are garden tools that happen to be necessary to aerate your lawn grass so it stays green and healthy. Aeration will allow air and moisture to run in to the root system hence enabling the roots to grow deeper and compact as well as thickening the turf. 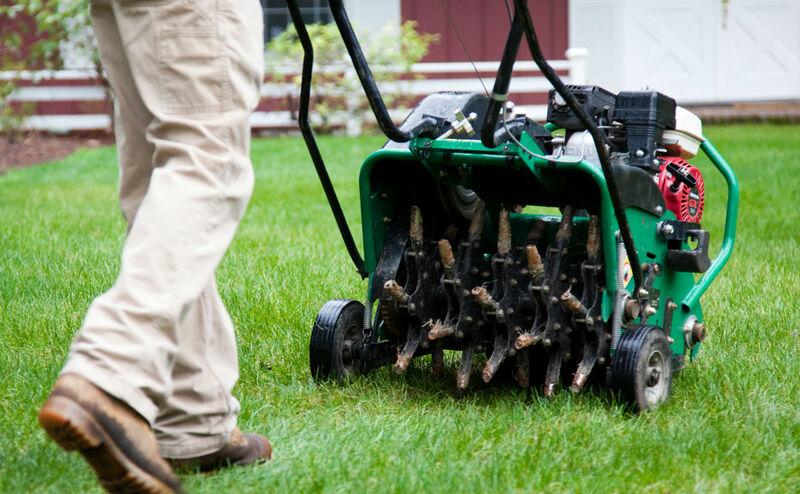 Regular aeration helps to ensure that the roots have grown deep to the soil after which frequent watering isn’t needed to keep your lawn looking lush and green. Aerating the soil on one’s lawn is one of the necessary maintenance procedures for achieving healthy green grass all year-round. This action addresses the issue of soil compacting brought on by foot and vehicle traffic, mowing, poor drainage, and wet soil conditions. Compacted soil has fewer spaces for oxygen and nutrients to flow, prevents plant roots from expanding, and disrupts water from soaking deeper into the ground. It’s always best to purchase lawn aerators during this season or you may also rent one easily especially if you need to have a larger machine. If you have never aerated your lawn before, then it’s advisable to do so at least 2 times yearly for the first two to three years. It is possible to bring the frequency down once the roots have grown deep enough and a healthy turf have been established. In fact, it only is needed to carry out aeration once in two or 3 years after the lawn grass has become healthy and lush. In the event the soil in your region is very compact or hard, then aeration could need more often and same is the case if you reside in a hilly or mountainous region. There are numerous techniques that you can aerate your grass but one of the easiest ways is by using some spike lawn aeration such as spike lawn aerator shoes. These are simply a pair of moulds which have lots of spikes coming out of the bottom of them and you slip these moulds over your shoes and then simply walk around your garden which places these spikes deep into the earth providing lots of core holes that will allow the water, air and sunlight to get to the roots. A sensible way to cut costs is to rent the equipment either on your own or on sharing basis with a neighbor who also needs to aerate his lawn. If you wish to cut costs, carry out the process by yourself or hire a professional who will charge you a little fee but will finish the job in a professional manner. When you are done with the aeration process, it is the best time to use fertilizers and overseed your lawn to ensure lush, thick and green growth in no time at all. Lawn aerators are an absolute must for anyone who wishes to have a lush, green and healthy lawn in front of their homes. Have you secretly adored the lush and beautiful seeking lawn in your neighbor’s house and pondered why yours never seems to look healthy enough? This is probably your neighbor regularly aerates his lawn which makes it appear lush and green all the year round. Lawn aerators are garden tools that happen to be required to aerate your lawn grass in order that it stays green and healthy. Aeration makes it possible for air and moisture to seep into the root system hence allowing the roots to develop deeper and compact along with thickening the turf. Regular aeration ensures that the roots have become deep into the soil after which frequent watering isn’t required to keep your lawn looking lush and green. There are plenty of different types of lawn aerators available these days; select one which happens to be suitable for your grass and soil type. Aeration shoes are an excellent choice for small spaces in front of your house while a rotary spike aerator will be required if your lawn is mid-sized. But if you have an massive lawn or require aerating massive spaces such as parks and sports fields, then a core aerator is essential for the job. Even though the first two are not hugely expensive, the latter is fairly heavy on the pocket. The decision for aerators significantly depends on your requirements and the size of your lawn. Rolling lawn aerators are usually pushed or towed behind a vehicle and consist of a drum or axle that has rows of spikes attached with it. Rolling aerators with hollow tines, permeate into the ground, taking out dirt cores that are then left on the surface to break up and return to the soil. The resulting holes enable better movement of water, air and nutrients to the roots. Another option which may be more practical should you have a large lawn or have to aerate a bigger area (such as a field) is a gas-powered lawn aerator. Nevertheless, keep in mind that this really is heavy equipment and even transporting the aerator home might be a two-person job. For that reason, many people who use a powered aerator a couple of times a year would rather hire someone to do it for them. The last method of aeration is liquid aeration. This method is the least known, yet considered by some as the best method. Liquid aeration is achieved by spraying a liquid solution over the ground, then watering it in. The advantages of using this method over core aeration are numerous. There is less mess, no cores in the awn. Another benefit is the liquid can be utilized everywhere, whereas the coring is limited around sprinkler systems, tree roots, etc. Are you aware that each year huge amount of money is allocated to lawn care and gardening? Sure, you heard right, billions of dollars and most households believe that it is money that’s well spent. The sad part is the fact that part of the money spent on lawn care is really wasted. The waste comes from the mistakes committed by the property owners when it comes to lawn care. If you’re a property owner and you have a lawn, then it’s highly likely that you are also responsible for committing some of these mistakes. Dull blades tend to be over looked yet it can have a major effect on the appearance and health of your lawn. Correct this problem and your mowing gets simpler while saving you time and energy. What we’re discussing now is your mower blade being dull as a butter knife. Picking the right mower could possibly be a challenge. There are many types, brands, and models available for purchase, how can you choose the best one? Each will have various features which will satisfy each individuals needs in a different way. You must have your own research so they won’t end up in a wrong acquisition. Avoid the use of wrong mower for your lawn. Many make the mistake of cutting their lawn shorter than they should. This is simply not healthy or beneficial in any way. Short-cut lawns expose surface roots to the hot sun, which could dry out and die quickly at all. Not only that, weed and insect are more likely to attack since the grass is stressed and weak from being over cut. As a general guideline never take away more than 1/3 of the grass blade. Depending on your lawn type, more or less can be cut-off. A common blunder people make is mowing their lawn when its wet. For newbies it’s messy, chokes out your mower and takes twice as long to end mowing. Cutting a lawn that is wet results in gobs of grass, which clump together and develops fungus. Left unchecked, the fungus spreads to other parts of your lawn. Lawn mowers are durable. Yet, you will still find instances when it could be damaged due to its age and due to carelessness. Due to this, you may require buying a new mower. Fortunately, this could be avoided with proper maintenance. You’ll want to grease all moving parts. If you utilize a gas powered mower, you need to check its oil. Mowing is also one of the gardening tasks that numerous people do incorrectly. The mistakes you commit when mowing have a negative effect on the health of your lawn and its overall look or appearance as well. Are you interested in a well maintained lawn on your property? Pros would certainly show you the main element to having a lush and healthy lawn is to master the fundamentals – mowing, irrigation, fertilizers, aeration, and weed prevention. Without knowledge on these fundamentals of lawn care, you would probably make a few key mistakes which could cause larger issues in your lawn. But how about understanding the basics in handling them in various seasons? Even though we know already the fundamentals of lawn care, it’s also crucial that you learn how to look after them in various seasons. Spring is loved by many because the lawn are set for a brand new season of regenerating and growing new plants and flowers that can make their yards more stunning and interesting. Lawn care experts say that in spring, greatest results are achieved by using a granular feed in which gives a regular quantity of nutrients over many weeks. When lawn feeding in the spring, make use of a lawn feed straight after cutting. By using a granular lawn feed, you need to apply it evenly on the whole lawn at the suggested rate using a lawn spreader. For warmer climes of summer you should continue with your mowing routine, cutting your lawn once weekly ensuring to not remove more than a third of the length at any one time. To prevent your lawn turning a less pleasant shade of brown and drying in the summer heat, it is important to regularly to water your garden. Even though, as this may at times be a problem, it may be calming to learn that if your lawn does turn brown, it will likely be quick to recover once the rain returns. Fall is the time for major lawn groundwork. Caring for it in fall makes sure that it’s going to survive the lower temperatures of winter. One of your largest tasks might be raking up fallen leaves and composting them. You will also must fertilize again this year, however with feeds high in potassium to strengthen up your grass for winter. You should aerate the lawn and apply top-dressing too. You can also lay sod and sow seed prior to it gets too cold. You’ll want to get this done ahead of the onset of winter. During winter season, it is possible to take advantage of lawn mowers. It’s not to cut back grass, but to get rid of snow. Individuals can just remove the lawn mower deck and change it with a snow blade. This way, you may get rid of excessive weight which may destroy your grass. Once you know what you’re doing, lawn care could be an exciting activity. If you spend some time each season in taking care of your yard, you’ll relish an attractive space all year round.